While front-page headlines have increased awareness, network and application security threats continue to advance more quickly in both number and complexity. Enterprises must seek new, more advanced solutions for safeguarding customer data, intellectual property, financial assets, and their all-important reputation. But even after investing heavily in systems and services, countless enterprises fall prey each year to devastating outages, often prompted by catastrophic distributed denial of service (DDoS) attacks. Today's attacks still employ brute force flood attacks like SYN and DNS that have been around since 1990s, but attackers are also using legitimate-looking traffic designed to consume network and application resources. 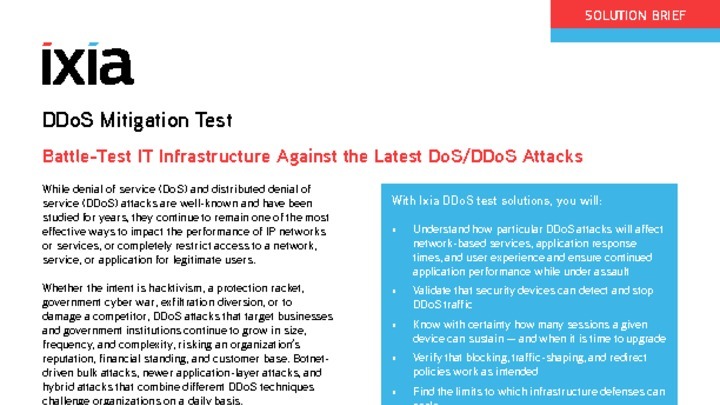 Often DDoS is used to create a diversion for other malicious activity.